SAMBALPUR: As many as 108 patients suffer from Chronic Kidney Disease (CKD) in Dakra gram panchayat under Maneswar block of the district. With safe drinking water a luxury for the people in several villages of Western Odisha, the disease has taken roots in more areas of the region. The Government, it seems, is unprepared to counter the alarming situation in the block. While the Government has miserably failed to supply safe drinking water to the affected pockets, the healthcare system too is in doldrums to face the challenge. The medical college and hospital of the region, VIMSAR at Burla, continues to struggle with large-scale vacancies. Adding to the woes of patients, a senior resident of Medicine department has been managing the Nephrology department in the absence of a Nephrologist. Moreover, the Government is yet to get a survey done to ascertain the exact cause of rising CKD cases. The kidney disorder, which was confined to a few pockets of Western Odisha, has spread to new areas, posing a bigger challenge to the Health department. The facts came to the fore during a mega health camp organised jointly by Apollo Hospital and Maneswar block BJD in the GP on Thursday, a month after rising cases of CKD were reported in this paper, ‘Kidney deaths stalk Sambalpur villages’. From about 200 patients screened at the mega health camp, 108 patients were identified with CKD and nearly 86 others with cardiac problems. 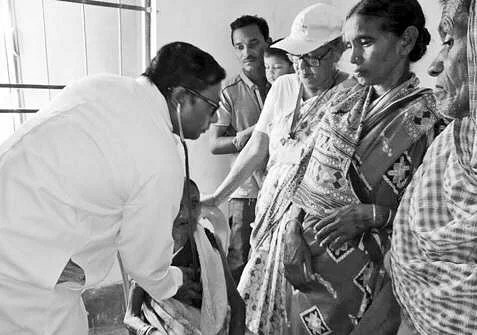 Patients were examined by Nephrologist Dr Bibekananda Panda and Cardiologist Dr Byomokesh Dixit. Dr Panda said the reason behind the spread of kidney ailment can be ascertained after water samples from the GP are chemically analysed for metal content. Out of 108 patients identified with CKD, 10 need immediate dialysis while the rest need immediate specialised medical attention, he said. The situation is alarming and immediate health intervention is needed, he added. Apart from water, there are numerous other reasons behind the spread of the disease and all cases need to be identified individually and corrective measures taken, Dr Panda added.Earlier, a study by Red Cross in Dakra Gram Panchayat had revealed about death due to CKD in Dhaunrakhaman village under the GP. The survey also found presence of a large number of such cases in the villages of Dakra, Purnapani, Jaduloisingh, Jhariadera, Golabhanga and Aamkuni, all under the GP. The survey had identified 12 patients with CKD in Dakra village alone and three deaths in the last three months due to CKD. Adding to the woes of patients, the Health Sub-Centre in the GP is closed in the absence of doctors while there are no paramedical staff to conduct tests or create awareness among the villagers. Entry filed under: Athmallik, Balangir, Bargarh, Boudh, Deogarh, Health Care Facility, Jharsuguda, Kalahandi, Nuapada, Region watch, Sambalpur, Subarnapur, Sundergarh, VSS Medical College.